The Americas have a vast land that can offer millions of attractions that will surely make you confused to choose. Most people will plan a vacation in America in just a few places, such as the Florida and California beaches, or remote areas like Hawaii and Alaska. The United States is home to some of the most spectacular scenery in the world. The country is also home to some of the most famous phenomenal places in the world. Due to the vast selection of tourist attractions in America you can visit, we have summarized 10 of America's most famous and popular tourist spots. The White House or the White House located in Washington DC is the official residence and office of the President of the United States. Built between 1792 and 1800, it was first used by President John Adams. For now access to visit the White House somewhat more difficult than before there was a WTC bomb event. To be able to visit this building, travelers must make a reservation at least six months prior to the date of the visit through members of Congress or US Ambassadors in their respective countries and limited to only 10 groups at any time. Las Vegas is a tourist place in America that has become a world gambling icon. Located in the southern desert of Nevada, the Las Vegas Strip is known as a resort, hotel and casino center. Walking along the Las Vegas Strip, you'll be treated to breathtaking views of mega resorts and giant casinos with sparkling luxury amenities such as walking in an amusement park for adults. Waikiki is home to the famous beaches of the Hawaiian Islands and beyond. Waikiki has been a popular tourist destination for a century because it is a cross between a tropical paradise and a modern city. In this American tourist spot you can feel the pleasure of relaxing under a palm tree, feeling the breeze of the sea and the pounding of the waves that reconcile the heart, with the background of tall buildings and shopping centers . Here tourists from all corners of the world gather for sunbathing, enjoying typical culinary , shopping, and surfing. Florida Keys is a collection of coral islands located off the southern coast of Florida. Florida Keys has become one of America's most popular tourist attractions for Americans looking for a tropical vacation without having to leave their own country. Major tourist activities in Florida Keys include fishing, scuba diving and snorkeling, boating, sailing, kayaking, and eco-tours. The Florida Keys have a length of approximately 110 miles and each is connected to a bridge called the Overseas Highway. There are 5 exciting spots in Florida Keys, Key Largo where you can enjoy the underwater beauty, the famous Islamorada as a sports fishing location, Marathon which offers a variety of resort for a relaxing place, Big Pine Key which provides various types of tours such as snorkeling or bird watching, and Key West which is also known as Last Resort. Opened in 1971, Walt Disney World managed to maintain its existence as an amusement park that appeals to children or the elderly. Located in Bay Lake, Florida, this American tourist attraction has many attractions that will not be completed in one day, from Disney's Hollywood Studios, Disney's Animal Kingdom, Magic Kingdom, Disney's Wedding Pavilion, Disney Springs, Epcot, Disney's Typhoon Lagoon, Disney's Blizzard Beach, golf course, and many more. It takes approximately 7 days to be able to enjoy all the rides that are in Disney World. The Golden Gate Bridge is a suspension bridge that stretches across the Golden Gate Strait, connecting San Francisco Bay and Marin County. This bridge is considered as the most beautiful bridge in the world, especially for photography lovers. Opened since 1937, the Golden Gate Bridge is the longest suspension bridge in the world. The orange red color of the Golden gate is specifically chosen to make the bridge easier to see through the thick fog that often covers the bridge. Yellowstone National Park is the first national park in America that began to open in 1872 with the aim to preserve a large number of geysers and hot water, protect wildlife, and maintain the beauty of the area. Of the many geysers that exist in this tourist spot in America, the most famous named Old Faithful Geyser. This geyser is one of the most predictable geographical phenomena on earth because it erupts every 90 minutes. 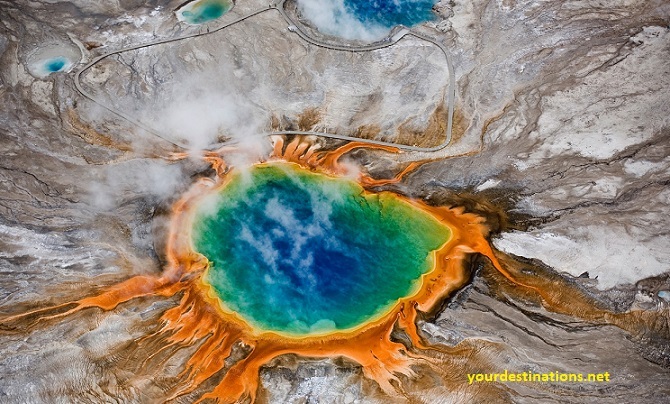 In addition, there is also Grand Prismatic Spring which is the third largest hot springs in the world with a blend of red, yellow, orange, and blue. The stunning color of Grand Prismatic Spring is caused by pigmented bacteria that grows around the edges of the water. Some of the wildlife you can find in this area include bison, antelope, black bear, and grizzly bear. Manhattan portraits must have been found in many movies. Manhattan offers many places to visit, ranging from skyscrapers, the Statue of Liberty, Broadway shows, the Empire State, a leisurely stroll in Central Park, and the most famous is Times Square. Times Square is a major commercial intersection located in Manhattan. This intersection is adorned with gigantic and majestic advertising billboards. Time Square is also touted as The Center of the Universe which is one of the busiest pedestrian intersections in the world. Approximately 400,000 people pass through Times Square at any time, and many of them are international travelers. So while visiting Manhattan be sure to take some photos in Times Square. Niagara Falls is located between the state of New York and the province of Ontario. This waterfall is one of the spectacular natural wonders in North America. Niagara is divided into three waterfalls namely Horseshoe Falls, American Falls, and Bridal Veil Falls. The Horseshoe Falls waterfalls are mostly located in Canada, while the American Falls and Bridal Veil Falls are included in an American state separated by Goat Island. This waterfall annually can attract more than 14 million tourists and has managed to become one of the most popular tourist attractions in America. The Grand Canyon is located north of Arizona and is one of America 's largest and most popular tourist attractions . This gorgeous canyon is carved by the Colorado River for millions of years over a depth of more than 1.6 km and a length of 446 km. Although not the longest and largest canyon in the world, the Grand Canyon is unique with its spectacular scenery and beautiful colors. The South Rim is the most visited part of the Grand Canyon. The best time to visit the Grand Canyon is between June and October because in November to May access will be limited due to snow conditions.